Artwork details: gouache, 12 x 12 inches (30 x 30 cm), 2005. The Mermaid here has grown tired of mooning around shipwrecked sailors - who usually turn up dead anyway, and even if they don't they can never enjoy her watery lair. Nope - she's a very sensible mermaid and has fallen in love with a fish instead... I'm not entirely sure what the fish's views are on this - I suspect a bit of a one-sided relationship, but I hope he will be happy with his slippery bride. This is a circular painting - scroll down to see the whole picture. 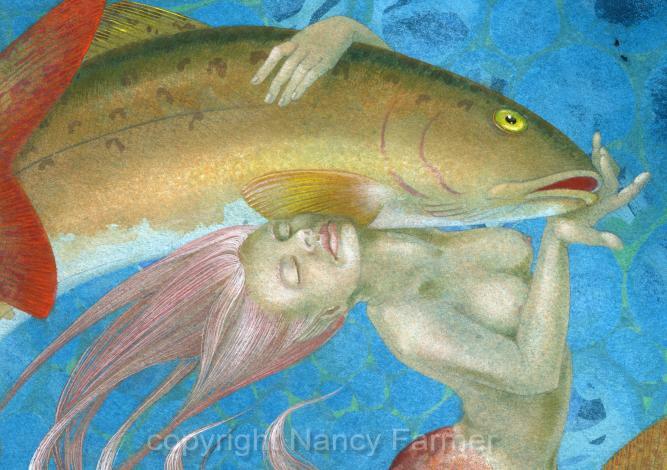 'Fishwife' - mermaid and fish - detail of painting. 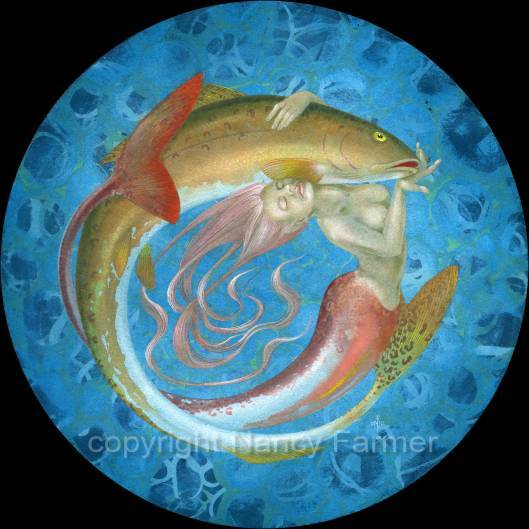 Another circular mermaid picture I painted was 'Finderskeepers' - to see that click the thumbnail to the left. For some reason I find that mermaids and circular paintings go very well together - I suppose it's partly that there need be no ground and no horizon, so there is nothing to upset the circular quality of the composition - but I have never yet done a fairy painting that was circular - and they don't need the ground, either, so perhaps it has more to do with the swirl of water.